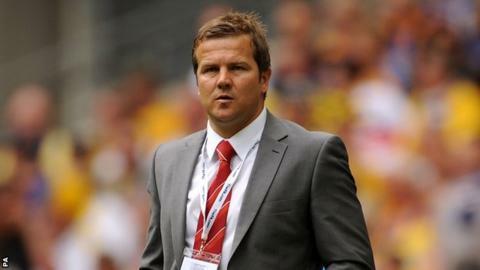 AFC Telford have placed ex-Peterborough and Darlington manager Mark Cooper in interim charge at the New Bucks Head until the end of the season. The 44-year-old replaces Andy Sinton, who was sacked on Thursday after a run of 16 league games without a win. Cooper, who led Darlington to lift the FA Trophy in 2011, will take charge against Cambridge United on Saturday. Assistant manager Graham Hyde and first-team coach John Psaras will continue their roles with the Bucks. "We are very excited to have Mark on board and now urge all of our fans to get behind him and the team for the remainder of the season," managing director Lee Carter told the club website. "We have 16 cup finals between now and the end of the season and we want our supporters right behind us. "They say there are no guarantees in football, but one thing I can promise you is that we'll be working night and day to keep this club in the Blue Square Bet Premier." Cooper, who made 338 league appearances during his playing career, first went into management at Tamworth in 2004 and led them to the FA Cup third round in two consecutive seasons. He left the Lamb by mutual consent in 2007, before joining Kettering and leading them to the Conference North title. His successful spell with the Poppies led to Championship side Peterborough placing him in charge, but he was sacked after just 13 games. And following spells at Darlington and a second at Kettering, Cooper has taken charge of first-team matters at AFC Telford.